The form is a direct copy of a Rhenish stoneware jug. Decorated in blue yellow and ochre on a tin glaze with a central roundel bearing the date 1558 within acanthus scrolls, the reverse boldly painted with two tulips. 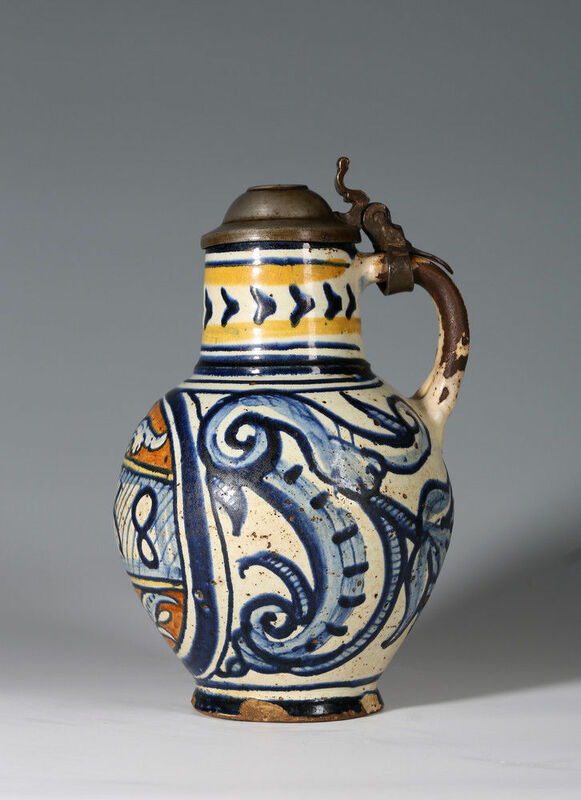 The form of this jug can be associated with an example in the Keramiekmuseum Princessehof, Leeuwarden (OKS 1984-28). The form is almost identical, with an oviform body on a slightly spreading, concave foot below a cylindrical neck with a sharp raised rib where the neck joins the body and the same handle. The treatment of the decoration on the neck is also very similar. 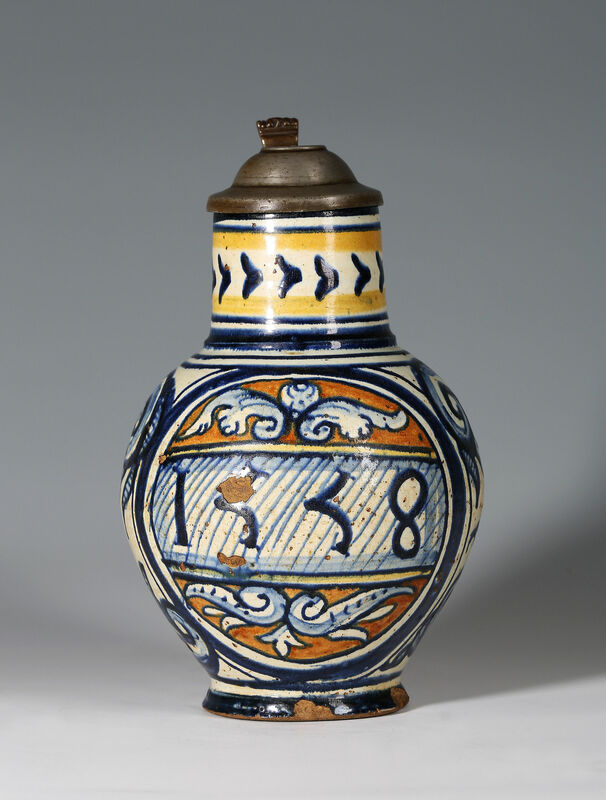 The Princessehof jug has been matched precisely to kiln wasters with identical decoration of the Instruments of the Passion excavated from a maiolica kiln at the medieval house ‘Oudaen’ at Oude Gracht 99, in Utrecht. A partially complete jug of similar form, with the same slightly concave underside to the foot, was also amongst the kiln wasters excavated from this site. This form is not known to exist elsewhere. 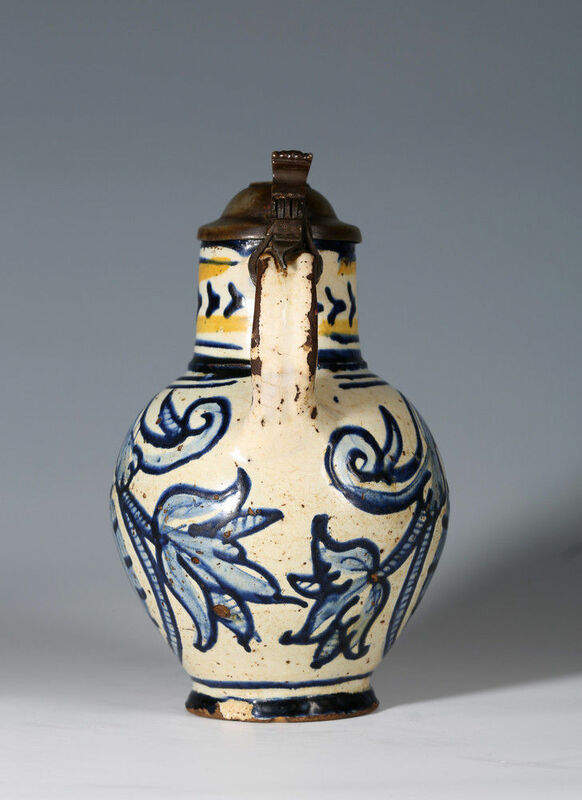 Jan Daniel van Dam in his paper on the Princessehof jug, ‘Zestiende-eeuwse Majolica uit de Nederlanden’, suggests that the unknown potter in Utrecht probably came from Antwerp and was active around 1560 or slightly earlier. 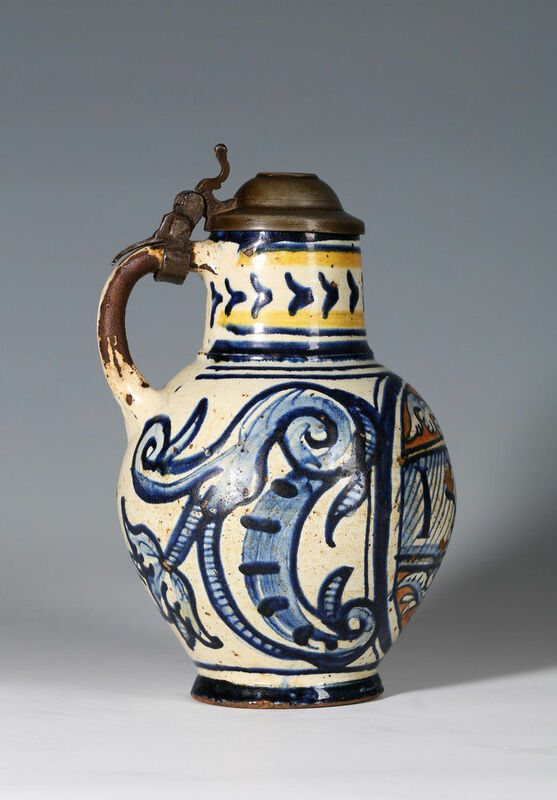 We believe this unrecorded and recently discovered jug to be the earliest dated piece of Dutch tin-glazed earthenware, the forerunner of the great Delft tradition in Holland. A Thermoluminescence Analysis by Oxford Authentication (No. N118d42) is consistent with the date 1558. An analysis of the body composition by Dennis Braekmans of the Cranfield Forensic Institute indicates that the clay used is not from the Antwerp area and is consistent with the North Netherlands. Italian potters brought the techniques of maiolica developed in renaissance Italy to Antwerp in the early 16th century. The most successful of these was Guido di Luca Savino, of Castel Durante, who came to Antwerp about 1508 and set up the most important maiolica workshop in the city, adopting the surname Andries. 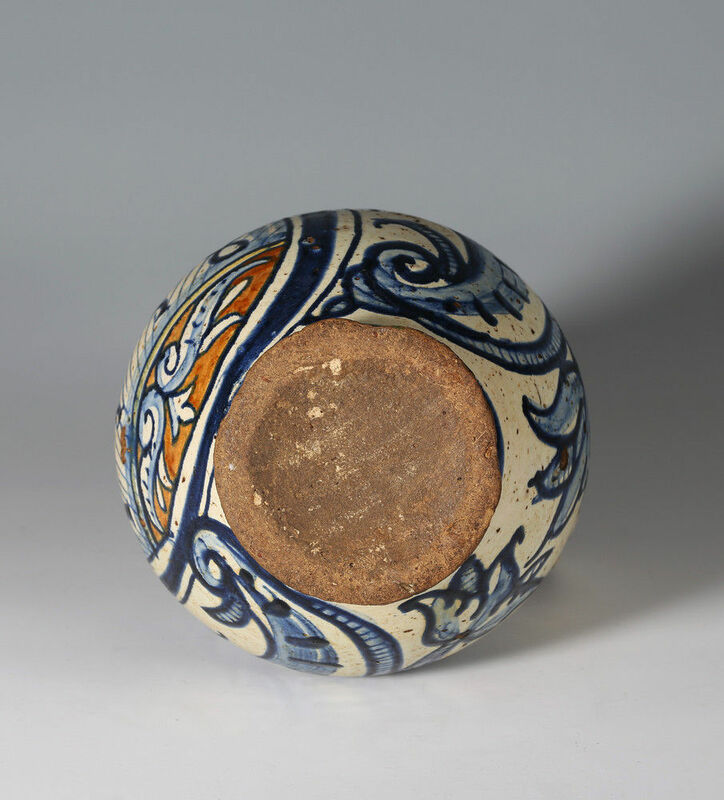 Others of this interrelated group of potters took their skills to Utrecht and Bergen-op-Zoom in the North Netherlands whist others migrated to Spain and eventually England. The next earliest recorded piece from The Netherlands is a heavily restored dish with the arms of Amsterdam dated 1572 in the Frans Hals Museum, Haarlem. A dish with a portrait of a lady, said to be Haarlem, dated 1583, is in the British Museum, Franks Collection BM1885.0508.40. Dingeman Korf, Nederlandse Majolica, p. 31 figs. 49 and 50, illustrates sherds dated 1580 and 1582 from Dordrecht and Haarlem. Even in Antwerp maiolica the only earlier dated pieces are some tiles and the centre of a dish with the Conversion of Saint Paul, dated 1550, in the Rijksmuseum Amsterdam. The famous large jug in the Musées Royaux d’Art et d’Histoire, Bruxelles, is dated 1562. Condition – Some chipping and wear to glaze. No restoration. We do not know if the pewter mount is partially original or not; it has probably at least had some restoration, the thumbpiece perhaps added. Literature – Jan Daniel van Dam, ‘Zestiende-eeuwse Majolica uit de Nederlanden’, Mededelingenblad Nederlandse Vereniging van Vrienden van de Ceramiek – 130/131, pp. 13-18. T. J. Hoekstra, ‘Oude Gracht 99’, Archeologische en bouwhistorische Kroniek van de Gemeente Utrecht 1985, pp.187-197. Jan M. Baart, ‘North Netherlands Maiolica of the Sixteenth Century’ – ‘Maiolica in the North: The Archaeology of Tin-glazed Earthenware in North-West Europe c.1500-1600’, British Museum Occasional Paper No. 122, 1999, edited by David R.M. Gaimster. pp. 125 -136. Dingeman Korf, Nederlandse Majolica, Bussum, 1981.